1In the Suiyuan Shidan, the term hun (葷) is used as an umbrella term in a few places not only for Chinese Buddhist vegetarian ideas of what are or are not forbidden foods, but also to note various assertive stenches or flavours. The former category consists of all animal based food as well as all plants form the garlic family, which are believed to disrupt one’s Buddhist practice. The latter, although less common in modern usage, nevertheless feels appropriate considering how delightfully sinful these strong flavours and smell are. 2Disappointingly little is said here about this very tasty and easy-to-grow vegetable, but perhaps it’s omitted because it’s considered common knowledge? Venus clams1 are very good shucked and stir-fried with garlic chives. They can also be cooked as a soup. Overcooking will make them dry and tough. 2This could either mean “cooked in broth” or “cooked as a soup”. Considering that the flavours of clams are easily ruined by the flavours of broths from other ingredients, it’s likely the latter. Stir-fried shrimp is done in the same manner as stir-fried fish and can be cooked with garlic chives. It can also be cooked with mustard greens picked during the winter if one cannot eat garlic chives.1 There is also a recipe where the body of the shrimp is pounded flat2 and stir-fried on its own that was quite novel and interesting. 1 Chinese not eating garlic chives does so usually due to Chinese Buddhist dietary restrictions. 2 Chuibianqiwei (捶扁其尾) means “tail pounded flat”. But anatomically, it is not the tail of the shrimp that is the subject of flattening but the meaty abdomen instead. It’s unfortunate that across various cultures this part has also been named “the tail”, though understandably if one sees the cephalothorax with its head and guts as “the body”, the abdomen would logically be the tail. PS: Real life has been crazy. Many apologies for the lack of recent posts! This describes a typical stir-fry recipe that easily falls into the category of “household dishes” (家常菜). These are simple dishes that anyone with a decent amount of cooking skill could prepare at home. Yuan Mei listed it probably because he liked it. As usual, there were some ambiguous bits in this text the required some thought during translation. First, the part which I translated as “when the pork starts to crackle”, actually has the rather vague literal translation: “when you hear (it) making sounds” (聞響). But we all know that any ingredient “makes sounds” when you fry them, so one has to assume that this sound is pretty different from the usual frying pork sounds. And what sound would this be? My experience with frying pork is that sometimes it pops or crackles, thus my translation. Still, a more accurate translation may be: “when the pork starts to make some extraordinary sounds above what one expects to hear when frying.” I’ll leave it to whomever tries out this recipe to tell me what sound the pork actually makes. Second is the ingredient “gua” (瓜), which I translated as “squash”. The word “gua” is basically used in Chinese to describe all manners of “vegetable fruits” under the Order Cucurbitaceae, which includes cucumbers, gourds, luffa, watermelons, and squashes. Papaya (木瓜), though not in this phylogenetic groups is also considered a gua due to its shape. As such, one has a world of possible gua to pick from from when cooking this dish. Personally, I think the edible varieties of the bottle gourd (瓠瓜), cucumber (黄瓜), or the miniature variety of wintermelon (毛瓜, Benincasa hispida var. chieh-qua) would all work well for this recipe. As for what “gua” Yuan Mei had in mind, heaven knows. Another method is to fry the pork in oil first then quickly braise it with soy-sauce and wine. Plate the pork when it is red in colour. The dish is particularly good when finished with garlic chives. 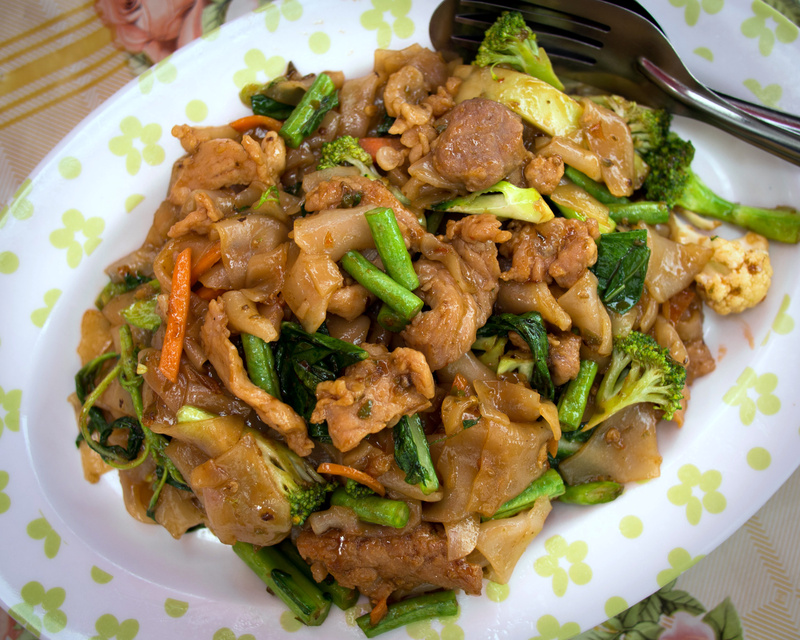 In this section are two rather different recipes for pork strips, one stir-fried and one braised. The first recipe is more or less Ganchao Niuhe (乾炒牛河), but done with pork instead of beef. 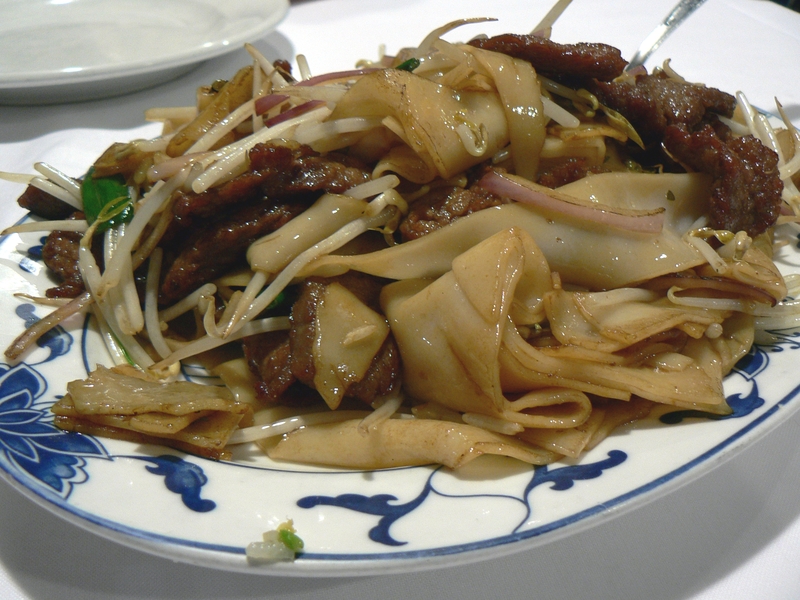 The details given here about the temperature of the oil, the continuous stirring, and the relatively small portions of ingredients illustrates the key to this type of stir-frying, known as “bao” (爆). Cooking more pork and using oil that is not burning hot would create a wet stewed dish devoid of the wok-hei needed to make this recipe a success. The second recipe actually sounds a lot like a simple dish my mother used to make for dinners. I can attest that it’s quite good. Take a chunk of pork, remove the skin and chop the meat until it is thoroughly minced. For each jin of pork stir in the yolks and whites of three chicken eggs, then mash the mixture until its texture is fine and smooth. Mix in half a wine cup of autumn sauce and chopped green onion, then wrap this mixture in a large sheet of caul fat. Pan fry the wrapped meat in four liang of vegetable oil until both sides are done and remove it from the wok. Unwrap the meat  and simmer it gently in one tea cup of good wine and half a wine cup of light soy sauce. Remove it from the wok, slice, and finish with a topping of garlic chives, shitake mushrooms, and cubes of bamboo shoots. : Despite its fancy name, this is basically Chinese-styled meatloaf. : I believe this step of removing the wrapper around the cooked meat is the namesake of the dish. “Tuosha” (脫沙) literally means “removing the layer of sand” and is used by jade hunters to describe removing the outer sandy/hazy layer on a chunk of raw jade. Removing the crusty fried caul fat would have this effect. Another interpretation is that “sand” (沙) in this case may be a shorthand for gauze（紗布), which would refer to the gauzy caul fat used in the preparation of the dish that has to be removed before finishing and serving, hence lifting the gauze. Yet another interpretation, would be that the “sand” (沙)acutally refers to a veil (面紗), and thus the name of this dish would be “lifting the veil”. A name wih slight flirtatious connotations?